Did you know that Feb 14 is not only the Valentine’s Day, but this year it is also the Chinese New Year?!? 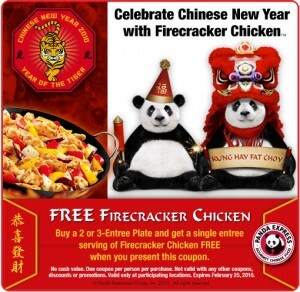 Panda Express is celebrating Chinese New Year by offering a FREE entree of the Firecracker Chicken when you buy one 2 or 3 entree plate. Click HERE to print out the coupon. Expires 2/25/10. Click here to find a Panda Express near you.